Some families are Ford Families, Chrysler Families (well there used to be) but we are an IZEA Family. 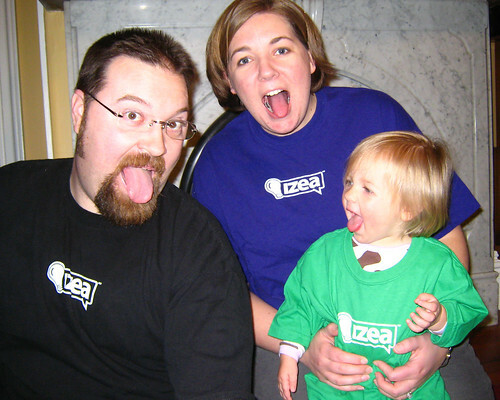 Our family has been involved with IZEA since 2006 and we are so excited about the latest relaunch of the IZEA.com site. The entire site was designed by IZEA CEO Ted Murphy. Ted knows how to design. The site is a wordpress blog but you’d never know because it is so unique. I am in awe of what Ted created. What I am also in awe about is that on IZEA.com I have my very own page. Yes, a page all about me. Because I am one of the IZEA Insiders I have a personal profile page with links to all of my social media connections, a photo and a mini bio. You can even go and leave a comment about me. Be Kind. For the photo, all we have to do is say “Ted Murphy” and Eva sticks out her tongue. Training kids is fun. Training kids is fun – LOL! Annas last blog post..Is This Cheating? Oh yeah it is really fun, just ask what she does to smokers. It is hilarious. Hahaha! That’s great – love the family portrait! I totally agree about the site redesign – it ROCKS! Eva is completely adorable, as usual. Ted’s turning into a ‘national uncle’ – my daughter, Sammie, thinks he’s silly and hysterical, too! It’s kinda funny how he’s having an effect on all these kids he’s never met – lol! Lisa Marie Marys last blog post..Soul-Flower Hippie Clothes ROCK! Glad you like the family portrait, yeah Ted is like America’s Uncle. He gets the kids all riled up with his antics and then you have to calm them down. LOL. I love the page there and it is really fun being an official part of it. It is so very fun. OK, I’m asking. What does Eva do to smokers? Because I am one of the IZEA Inisders I have a personal profile page with links to all of my social media connections, a photo and a mini bio. You can even go and leave a comment about me. She wags her finger 3 times and says no. no. no smoking. And then the pinches her nose and says stinky. We’ve been training her to say “Grandpa Dano… stinky” too. And eventually, “Why do you keep smoking, don’t you want to dance with me at my wedding?” Sad puppy dog eyes. We’re a ways from that one. I should put goosegrade back on the site so people can correct me all the time. Sometimes I write so fast I screw things up. It is even cuter (Eva that is) in person. Congrats on the relaunch, it is fantastic. For some reason this post was linked to my blog. I will have to check out the new Izea. Thanks. This post linked to your blog, That is odd. I didn’t link this post over to your blog. Enjoy the new IZEA. Thanks for stopping by too.